Do you ever slip into a funk and can’t seem to pull yourself out of it? and yet nothing feels quite right either. Your life force energy may be out of kilter. I know the feeling well, and I’ve learned what to do to lift myself out of it. Our bodies are bathed in an electromagnetic field generated by the heart and other oscillating fields within the body, such as those created by respiration–breathing. Ancient yogis understood the powerful benefits of consciousness breathing and the effect on your state of mind, and body. Let’s take the example of “Ocean Breathing,” a yogic style of breathing known for balancing the nervous system and beyond. Ujjayi is also known as “Ocean Breath” because of the sound that is made in the back of the throat and nasal cavity while inhaling and exhaling. The ocean sound is made by narrowing the throat passage during breathing, similar to the sound of fogging up a mirror or your eyeglasses. 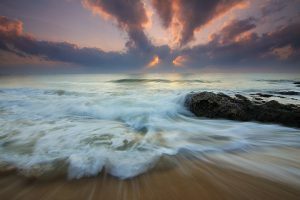 Ocean Breath is my “Go-To” breathing meditation that I use to boost my inner energy and raise my vibration back where it belongs—into a state of high heart coherence, indicative of a balanced autonomic nervous system. The breath will sound like the ocean; think of the sound you hear when you hold a sea shell up to your ear. It’s a gentle sound that can be heard if someone is close to you. Once you get the idea, begin the technique by breathing through the nose and gently narrowing the throat. HRV feedback is included here so you can understand the relationship between breath, thought patterns, and your nervous system (autonomic). 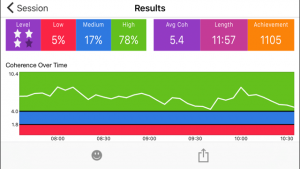 I encourage you to experiment with your own HeartMath® smart phone app to get the feedback on which techniques get you out of stress the most reliability. 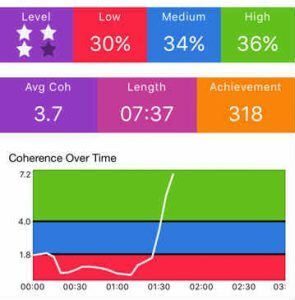 The meditations work with or without HRV feedback, but sometimes it’s helpful to get the visual confirmation. Just Go for the Green and get out of the Red! You don’t need to understand math, just shift from red (low coherence), into blue (medium coherence), and up into the green (high coherence). Important Note: Whenever you practice any form of pranayam, if you feel dizzy or lightheaded, resume normal breathing. Start slowly and build up as you would with any form of exercise. I hope you enjoy Ocean Sounding Breath as much as we do. It is a true treasure for people who want to manage their own stress naturally, through their own power. Please leave a comment below and let us know what your experience is with Ocean Sounding Breath.